Nepal is a country wrapping in mystique for many. The home of the highest mountain in the world and a civilization known for living in the harsh conditions of the Himalayas, Nepal has much to offer the photographic traveler. Photography in Nepal is often a once in a lifetime event for most and it is my intent to give you some glimpse. I have traveled most of the area of Nepal, India and Tibet and have only scratched the surface of all the exotic and varied subjects to photograph. For the rest of the country, I have done my own research, leaning on fellow photographers’ and travellers’ information. I hope it is of value to you. Maya Devi Temple is an ancient Buddhist temple situated at the UNESCO World Heritage Site of Lumbini, Nepal. 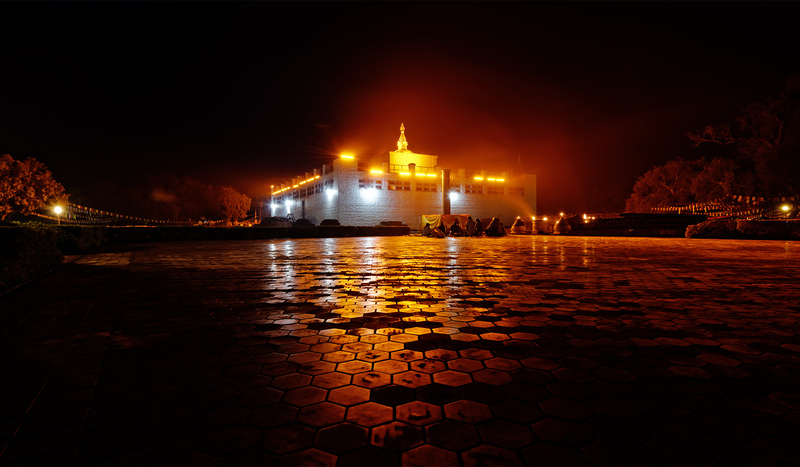 It is the main temple at Lumbini, a site traditionally considered the birthplace of Gautama Buddha. The temple stands adjacent to a sacred pool (known as Puskarni) and a sacred garden. The archaeological remains at the site were previously dated to the third-century BCE brick buildings constructed by Ashoka the Great. A sixth-century BCE timber shrine was discovered in 2013. 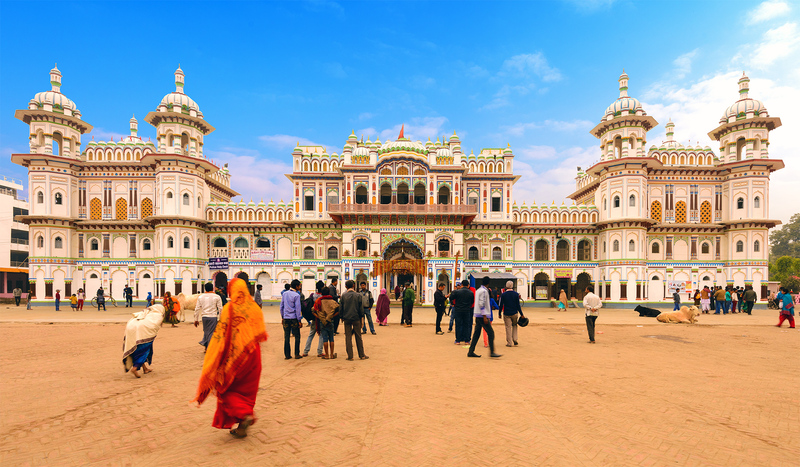 Janaki Mandir (Nepali: जानकी मन्दिर) is a Hinduism Temple at the heart of Janakpur, Nepal. It is dedicated to Nepali goddess Sita. It is the primary temple of native Nepali Maithils indigenous to Nepal. It is an example of 'Hindu-Rajput' Nepali architecture. This is considered as the most important model of the Rajput architecture in Nepal.Fully built in bright white, the temple is an example of perfect artistry. Constructed in an area of 4,860 sq. feet in a mixed style of Islamic and Rajput domes, the temple is 50 meters high. It is a three storied structure made entirely of stone and marble. All its 60 rooms are decorated with Flag of Nepal, colored glass, engravings and paintings, with beautiful lattice windows and turrets.According to legends, king Janak ruled this area (called Mithila Desh) during the Ramayana period. His daughter Janaki (Sita), during her swyambar, had chosen Lord Rama as her husband, and become queen of Ayodhya. There marriage ceremony is believed to have occurred in the nearby Temple. 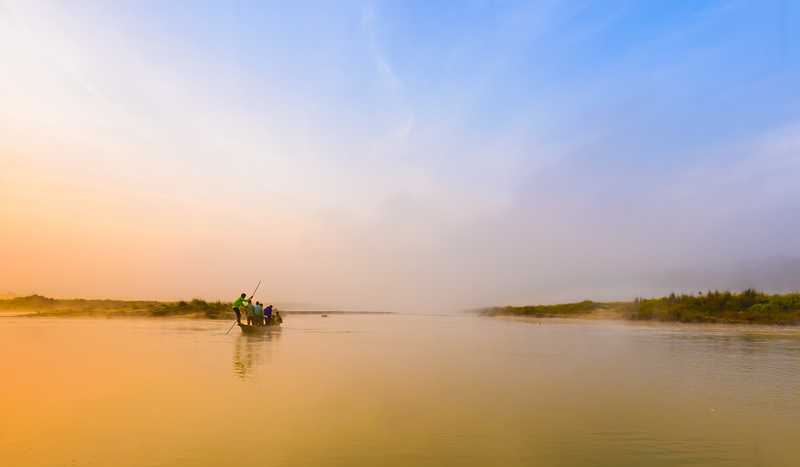 Early morning canoe riders passing through Rapti River at Chitwan National Park. Bouddha Nath also called Boudha or the Khāsa Caitya) is a stupa in Kathmandu, Nepal. It is known as Khāsti in Nepal Bhasa, Jyarung Khasyor in Tamang language or as Bauddha by speakers of Nepali. Located about 11 km (6.8 mi) from the center and northeastern outskirts of Kathmandu, the stupa's massive mandala makes it one of the largest spherical stupas in Nepal. 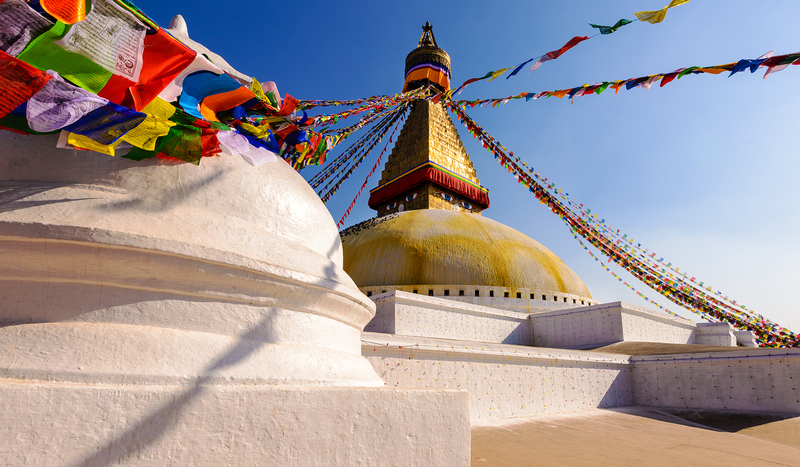 The Buddhist stupa of Boudhanath dominates the skyline. 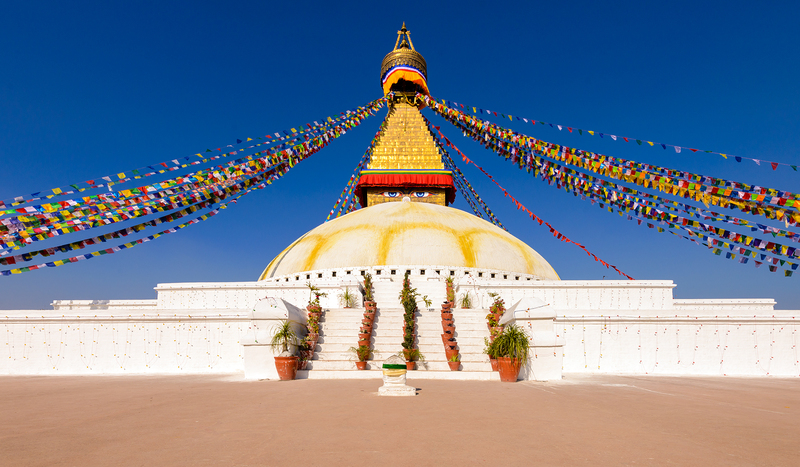 The ancient Stupa is one of the largest in the world. The influx of large populations of refugees from Tibet has seen the construction of over 50 Tibetan Gompas (Monasteries) around Boudhanath. As of 1979, Bouddhanath is a UNESCO World Heritage Site. Along with Swayambhunath, it is one of the most popular tourist sites in the Kathmandu area. Lumbinī is a Buddhist pilgrimage site in the Rupandehi District of Nepal, the place where, according to Buddhist tradition, Queen Mayadevi gave birth to Siddhartha Gautama in 623 BCE. Gautama, who achieved nirvana some time around 543 BCE, became the Lord Gautama Buddha and founded Buddhism after achieving Enlightenment. 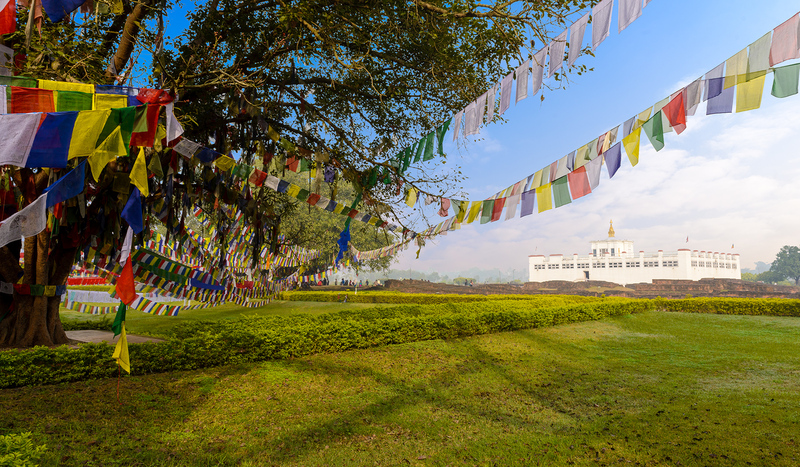 Lumbini is one of many magnets for pilgrimage that sprang up in places pivotal to the life of Gautama Buddha; other notable pilgrimage sites include Kushinagar, Bodh Gaya and Sarnath. 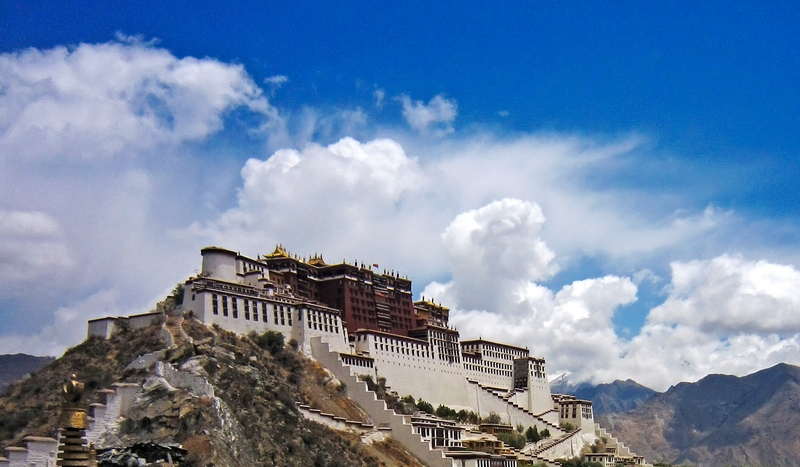 The Potala Palace was the chief residence of the Dalai Lama until the 14th Dalai Lama fled to India during the 1959 Tibetan uprising. It is now a museum and World Heritage Site. 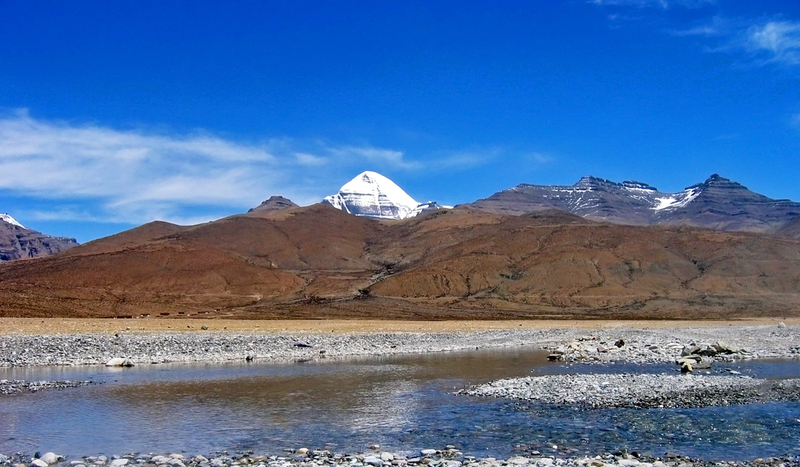 The palace is named after Mount Potalaka, the mythical abode of the bodhisattva Avalokiteśvara. 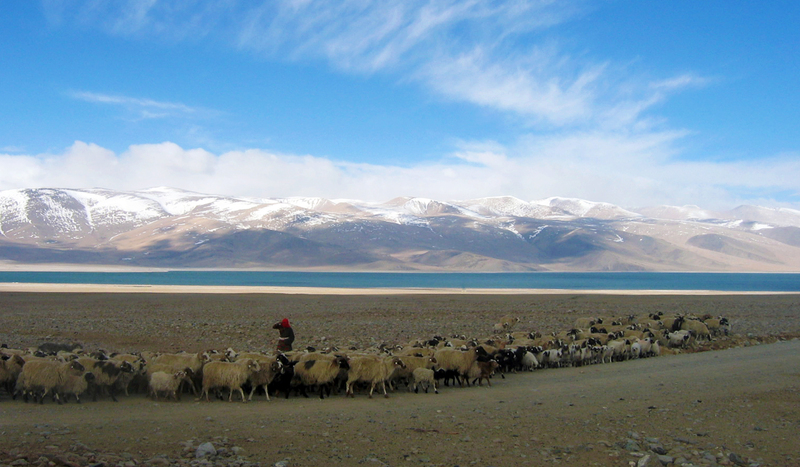 The 5th Dalai Lama started its construction in 1645 after one of his spiritual advisers, Konchog Chophel (died 1646), pointed out that the site was ideal as a seat of government, situated as it is between Drepung and Sera monasteries and the old city of Lhasa. 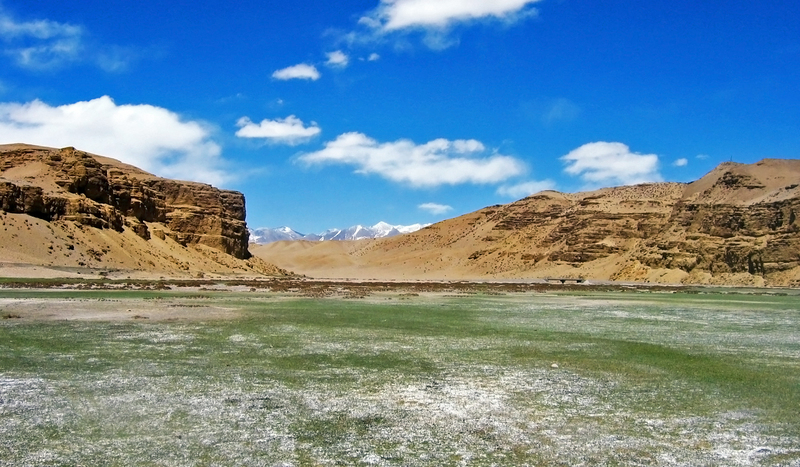 It may overlay the remains of an earlier fortress called the White or Red Palace, on the site built by Songtsän Gampo in 637.